Zoo Train!—1.5 years to 3 years old — Toddlers and trains make a natural match—always on the move. Tag along this summer with a traveling zoo train. Bring your own stuffed animals for the petting zoo. Wear long white socks on your hands for polar bear paws and learn about real animals in the zoo. Sing songs for clapping time, and use music to help toddlers regulate emotions. Home Materials: Zoo Train book, Home CD, animal shaker instrument, and poster. Busy Days: Who says babies have it easy? These sure are Busy Days–all around town, with errands here and adventures there, and fun and movement ’til the day is done. Peekaboo! A house with a baby is a house full of love. (And fun…and toys…and noise!) Peekaboo! peeks into the “1, 2, 3, punch” patterns of repetition, anticipation, and surprise. Have fun with vocal play, sensory exploration, and learning through play. ​Playtime! This unit is all about fun and predictability. Do it, then do it once more. That was fun. Let’s do it again! From Pop Goes the Weasel to Sally Go ‘Round the Sun, and Little Green Frog to Monkey See, Monkey Do, this unit is a non-stop play-fest that stresses the developmental value of predictability, repetition, and play. Way Up High: Experience opposite concepts with your voices, bodies, and movements, as well as instruments and props, in Way Up High! You’ll swoop and flutter fast and slow, high and low, as you explore spatial development and positional vocabulary, multi-sensory learning, and more. Silly All Over: This month, you’ll catch a case of the giggles. Motor skills and self-control get a workout with plenty of stop-and-go motions, energy gets tapped with plenty of up-and-down, and sense of humor gets a tickle with silly sounds, silly movements, finger plays, and fun. Hold onto your funny bone, because you’re about to get Silly All Over! ​Family & Friends: Sing, dance, rhyme, move, and play your way through this celebration of why our very special Family & Friends matter so much! Using our imaginations, we’ll visit our friends’ houses, interact with family, go to the market, play with playmates, and more. 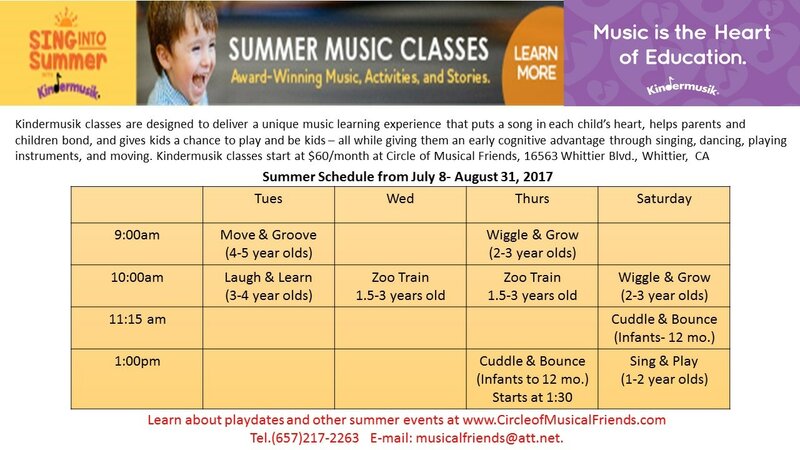 Everyone is invited to make music with our family and friends! Out & About: Out & About is a trip into the world of imagination, and all you’ll need to pack is a sense of adventure! We’ll ride bikes, hike in the mountains, scuttle like crabs, and fly like seagulls. Singing, instrument play, creativity, and movement all bring the learning to life. Make Believe: Where can you go to see pirates, castles, dragons, dinosaurs, and more . . . all in one place? That’s easy—your imagination! Climb aboard the S.S. Pretend and set sail to imaginary places in the land of Make Believe. You will dance the pirate’s treasure dance, visit Royal Island and the castle of a king and queen, and even meet a friendly dragon. Sing a Story: We’re off to the opera—it’s time to Sing a Story! You will meet some colorful characters from a Mozart opera called The Magic Flute, check out the hustle and bustle that happens backstage before a show, and learn more about Mozart, too. You’ll even explore the musical staff, and how notes a composer puts on a page become beautiful music! All Keyed Up: We’re All Keyed Up! There is magic to be found in those 88 keys! Immerse yourself in the magic of keyboards of all kinds. Listen to and learn about pianos, organs, synthesizers, and harpsichords. You’ll explore staccato and legato sounds, get to know the sounds of a few famous composers, and even experiment with composition.